New Knoxville, Ohio; 1993. From Fiegenbaum-Gerber family; all rights reserved. 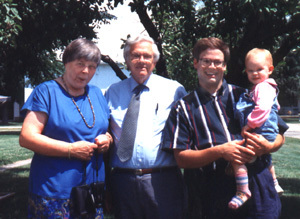 From left to right: Hermanda (Lagemann) Fiegenbaum; J. W. Fiegenbaum; Eric N. Fiegenbaum; Katherine Heath Fiegenbaum. This photo was taken in New Knoxville, Auglaize County, Ohio, where many people from Ladbergen, Bundesrepublik Deutschland (Germany) had settled during the 19th century. Because of these close ties, Ladbergen and New Knoxville maintain a "sister city" association. Residents from both towns regularly visit each other. Hermanda (from Münster, Germany), J. W. (from Amherst, Massachusetts) and Eric and Katie (from Malvern, Pennsylvania) had joined with many others in August 1993 to celebrate the Sesquicentennial of the United Methodist Church of New Knoxville, Ohio, 1843 — 1993.